As a business owner, you may be accustomed to battling large quantities of nuisance birds during the spring and summer months. Even though many birds might head south for the winter, leaving you feeling like you can let down your guard; there are also several pesky birds that could present an issue to businesses all year round. For instance, pigeons, sparrows, and starlings are just as likely to find food and shelter in or near your business over the cold winter months. Got Nuisance Wildlife? Learn more about how our Wildlife Control Team can humanly manage nuisance wildlife! A single pair of pigeons can produce up to 12 offspring a year! While beautiful to behold in nature, nuisance birds can actually present a significant risk to your business, employees, patrons, reputation and essentially your bottom line. Unsightly droppings not only damage your business’s reputation but it can create a serious health risk. 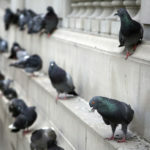 Bird droppings can carry over 60 viral, bacterial, fungal and parasitic diseases (ick!). Droppings are very acidic and can also create damage to metal, paint, and fabric (not to mention your vegetation and landscaping), thus creating the need for costly repairs to property, machinery, automobiles, rooftops and ventilation systems. 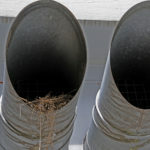 Troublesome nests in rafters, air ducts, chimneys, and rooflines can create noise disruptions and again health concerns. Bird nests and dropping are blamed for thousands of clogged drains every year! 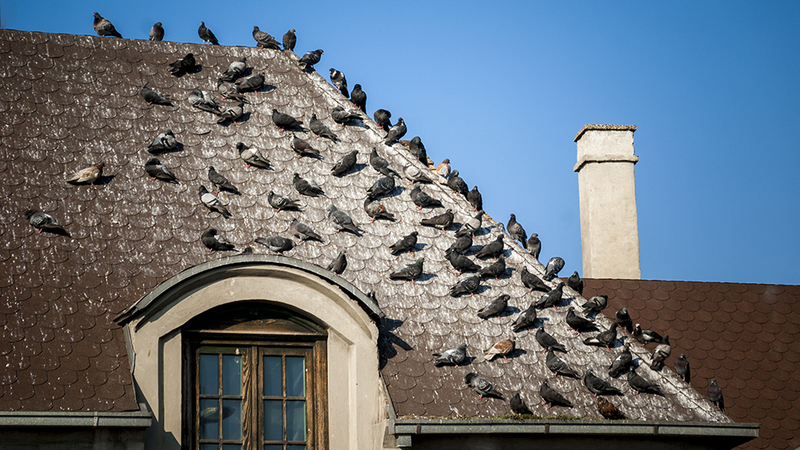 Bird problems are even known to impact property values. As a reputable company bird problems, if left unaddressed, can pose a real threat to your business and bottom line, all year long. Don’t make the mistake of assuming the threat has passed with the arrival of colder weather. Modern’s Wildlife Pro’s are extensively trained on bird behavior, habitat and biology and understand the latest most effective exclusion techniques for keeping bird pests away from your business. Our team will provide a free inspection to assess your bird pest issue and using an integrated approach, will develop a custom program for your business’s unique needs.